Mary Ann Hoeynck is retiring as the adoption coordinator for Good Shepherd Children and Family Services after 40 years of service to the Catholic Charities agencies that combined to form Good Shepherd. Her office includes photographs of families and children she has helped over the years. It’s hard to miss the photos on the oversized bulletin boards on Mary Ann Hoeynck’s wall. Too numerous to count, the photos are of children and families whose lives she has touched through her work. Hoeynck, who is retiring as adoption coordinator at Good Shepherd Children and Family Services, came to the former Catholic Charities Department of Children in 1973 as a Saint Louis University student doing her practicum. She started full time the next year as a social worker helping expectant parents. The agency became Catholic Services for Children and Youth before assuming the Good Shepherd name. Her parents were foster parents from 1946-87, and that’s how Hoeynck became interested in the agency and social work, observing the social workers’ interaction with the boys her parents fostered. At the beginning of her senior year in high school, she visited with the director of the Catholic Charities agency to inquire about the steps she would need to follow the career path. It was the one and only place she ever wanted to work. The first nine years, Hoeynck, a parishioner at St. Francis of Assisi in Oakville, worked only with birth parents. She took five years off to be home with her family. For the last 31 years, she assisted parents making a plan for adoption. She served as a social worker with expectant parents, then director of expectant parent services and adoption services. She then directed adoption services until Good Shepherd was established in 2006 as a merger of four Catholic Charities agencies to provide adoption and foster care services for children from infancy through adolescence. That’s when she became infant adoption coordinator. “I’ve loved it from the very beginning,” Hoeynck said. Hoeynck tells couples, “God has a plan for you.” She said the process is easier when couples have a faith base. In the early years, the agency placed about 150 babies into homes each year. Now, it gets a handful of babies a year, though many of the couples Hoeynck assists are linked with other agencies for placements. When she began her career, Hoeynck said, unwed pregnancy had a stigma that isn’t a factor in adoptions today. Abortion became legal in 1973 and its acceptance in society is seen in fewer babies being placed for adoption and there are more adoption agencies today. John Lowell and his wife, Tracey Gunn Lowell, adopted their son, William, two years ago, and daughter, Therese, last year with the help of Mary Ann Hoeynck at Good Shepherd Children and Family Services. The family reads books together in their living room. John Lowell said Good Shepherd is a “very important ministry. 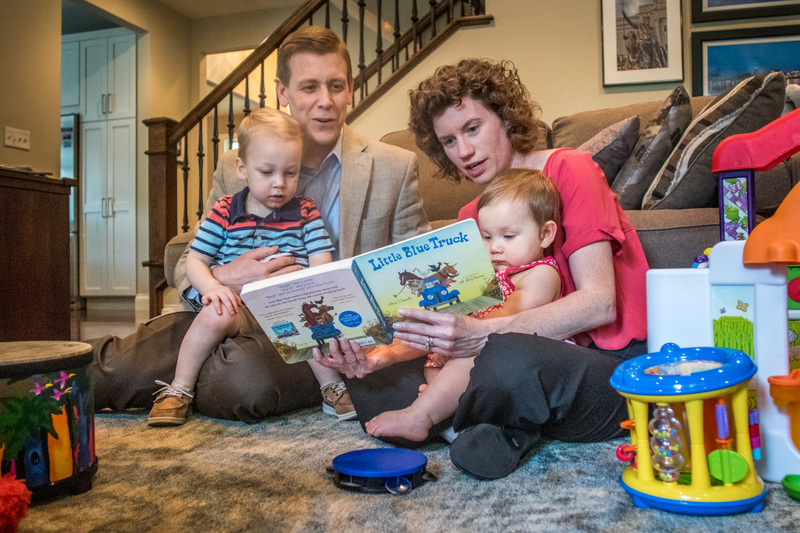 Adoption is a faith journey.” Members of Our Lady of Lourdes Parish in University City, the family also felt the support of their pastor and parishioners.